Both of these teams come into this game with a good record but the mood of the camps may not be in the same space. The away side should be the happier with a 4-1 record but they lost last time around with a home defeat to Unics Kazan being a particular sore one to take. Then again, the Gasteiz side also lost in their most recent home game, to Olympiacos, so both of these sides needs to get back on form. The Spanish side will take comfort in the fact that they hold an 11-6 record when it comes to overall Euroleague record. This is definitely something to think about but of course, it is improving the 3-2 record of this season that is most important for the Baskonia Vitoria Gasteiz players. The top man for the hosts so far this season has been Toko Shengelia, with an average of 14 points per game while Shane Larkin has managed to deliver an average of 12 points per game. Johannes Voigtmann has also chipped in with an average of 10 points per game this season. 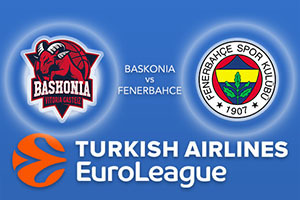 There will some pleasant memories for the Turkish side in this game as they defeated Baskonia by a score of 88-77 in the Euroleague semi-final last season. This was a big win, and even though they lost the final, the Turkish side had been performing well this season until last week’s blip. Bobby Dixon has provided an average of 14 points per game for Fenerbahce this season while Ekpe Udoh has delivered an average of 7.6 rebounds per game. These two players have been in good form this season and if the Turkish side are to return to winning ways, they’ll need to be at their best. This is a close game but take Fenerbache Istanbul at +2.5, which is provided at odds of 1.90. If you’re looking for the Over/Under market in this Friday night clash, go OVER 160.0 which is on offer at odds of 1.90. Bet Now!